Clyde & Co, Sullivan & Cromwell and Cahill Gordon & Reindel have won roles advising on Arch Capital Group’s bid to acquire American International Group’s (AIG) mortgage-guarantee unit for $3.4bn, in a deal which would create the largest private mortgage insurer in the world. Insurer AIG struck a deal with Bermuda-based Arch Capital after the company revealed earlier this year it would spin off its mortgage insurance business which includes United Guaranty Corporation (UGC) and AIG United Guaranty Insurance (Asia) Limited. The deal is expected to close between late 2016 and early 2017. Both Clyde & Co and Cahill Gordon & Reindel are advising Arch Capital while long-time adviser Sullivan & Cromwell is guiding AIG through the deal. In the US, Sullivan & Cromwell’s team included corporate partners Robert DeLaMater and Jared Fishman. In the City London-based partners Eric Wang and Juan Rodriguez also advised AIG for Sullivan & Cromwell. Clyde & Co fielded an international team of partners including New York-based partner Vikram Sidhu and Hong Kong’s Joyce Chan. Sullivan & Cromwell acted for AIG during the financial crisis in connection with its $85bn emergency funding plan with the US Federal Reserve and subsequent $30bn equity capital commitment facility. The deal is a significant one for Clyde & Co, which earlier this year advised global metals group Liberty House in its bid to acquire Tata Steel’s UK assets. Sullivan & Cromwell has appointed its leading M&A partner Richard Pollack as managing partner of its London office replacing Richard Morrissey who has held the role since 2011. With management experience as the firm’s co-head of PE and former co-head of its general practice group, Pollack specialises in cross-border mergers and acquisitions across a wide range of industries, as well as in public and private offerings of equity and debt securities on behalf of US and non-US issuers. His clients include Apollo, Barclays Capital, Compass Partners, Eurazeo, Groupe Bruxelles Lambert, Lightyear Capital, MatlinPatterson Partners, Navitas Capital, Olympus Capital, Ontario Teachers, Perry Capital, Reservoir Capital, Rhône Capital, Ripplewood Holdings and Silver Lake Partners. Pollack replaces Morrissey, the firm’s formerly the head of the M&A group in Europe and former co-head of the firm’s private equity practice. The firm’s London office posted an impressive 40% revenue rise to £36.8m this year, despite its headcount remaining relatively flat at 77 fee earners from 78 the year prior. Sullivan & Cromwell recently won a role advising healthcare and agriculture giant Bayer as it placed a bid to acquire agricultural company Monsanto for $62bn, in a deal which would create the world’s biggest agricultural supplier. Allen & Overy (A&O) is advising Bayer on the financing of the transaction, while Wachtell, Lipton, Rosen & Katz will advise Monsanto through the potential acquisition. Sullivan & Cromwell, Clifford Chance and Allen & Overy (A&O) have won roles as the world’s largest brewer Anheuser-Busch InBev NV (AB InBev) prepares to issue $46bn worth of bonds, in what may become the largest corporate offering in history. Sullivan & Cromwell advised Budweiser owner AB InBev on its US law matters with London partner George White and New York partner Francis Aquila leading, while tax head Ronald Creamer also advised. Clifford Chance provided advice to AB InBev in Belgium and Luxembourg. A&O represented the joint book runners and global coordinators Bank of America Merrill Lynch, Barclays and Deutsche Bank Securities as well as a syndicate of 21 underwriting banks on the pricing of the notes for AB InBev issued by its subsidiary, Anheuser-Busch InBev Finance. A&O’s London-based US corporate finance partner Adam Kupitz led the deal. The issuance is expected to close on 25 January 2016 subject to conditions. AB InBev will use the money to fund its takeover of brewing giant SABMiller. A&O also advised on that merger announced late last year with the firm advising the full syndicate of banks, led by partner Nicholas Clark. Freshfields Bruckhaus Deringer, Linklaters and Hogan Lovells also won roles on the deal that would create a $275bn company. In a rare move, Debevoise & Plimpton has picked up Hong Kong based corporate partner William Chua from US elite firm Sullivan & Cromwell. Chua joins Debevoise in a bid to strengthen the firm’s transactional capabilities in Asia, and to complement its private equity funds practice in the region. Part of Chua’s role will be to reinforce the firm’s growing strategic M&A practice in financial services and other sectors. Chua has been a partner at the Wall Street firm for 13 years and previously led its Beijing office. With experience in private equity, M&A, finance and capital markets, including takeovers, leveraged buyouts, going private transactions, divestitures and spinoffs, he has practised in Asia for over 15 years and is dual-qualified in New York and Hong Kong. He also has a finance and capital markets practice, including debt and borrower-focused acquisition and leveraged finance, and IPOs. Chua’s arrival represents the latest in a series of moves in Asia for Debevoise. In 2014, the firm converted its Hong Kong office to become a local practice, while later that year, Debevoise recruited Mark Johnson as a partner in the Hong Kong office. Johnson joined from Herbert Smith Freehills, where he was a partner for over 20 years. Amid a changing global legal market, three storied Wall Street firms retain commanding reputations. 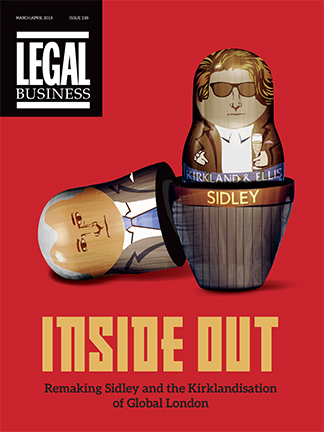 Legal Business assesses New York law’s enduring inner circle. Sullivan & Cromwell’s City office has been busy this summer winning roles on two headline deals announced yesterday [8 September], working alongside Clifford Chance (CC) on both Cinven’s £2.3bn sale of pharmaceuticals group Amdipharm Mercury Company (AMCo) and advising Goldman Sachs on Mitsui Sumitomo’s £3.5bn Amlin purchase. The US firm worked alongside CC to advise private equity firm Cinven on the sale of AMCo to Concordia Healthcare for £2.3bn, through a combination of cash, Concordia shares, and a potential; performance-based earnout of £145m over the next 12 months. Sullivan acted for Concordia with a seven-partner team from London and New York with Vanessa Blackmore, Krishna Veeraraghavan and Matthew Hurd advising on corporate matters; John Estes on finance; Michael McGowan covering tax; Robert Buckholz on securities; and Juan Rodriguez on antitrust matters. CC represented Cinven when it acquired Amdipharm and Mercury Pharma in 2012 to create AMCo, and has led on all of its five bolt-on acquisitions and related financings. Global private equity head Jonny Myers led CC’s team, alongside antitrust partner Alastair Mordaunt, partner Rod McGillivray on debt financing matters; and Michael Dakin who advised on high yield. The two firms also jointly represented Goldman Sachs, who was the lead financial adviser and lender to Mitsui as it became the latest foreign investor to purchase an insurer, buying Amlin for £3.5bn. Sullivan’s head of European M&A Tim Emmerson and corporate partner Ben Perry led out of London. Skadden, Arps, Slate, Meagher & Flom represented Mitsui with a London-based team including corporate partner Scott Hopkins and Robert Stirling; banking partner Mark Darley; tax partner Tim Sanders; and employment specialist partner Helena Derbyshire; while Simon Baxter advised on competition in Brussels and corporate partner Hiro Kamiya acted in Tokyo. Travers Smith advised Mitsui on employee incentives and real estate aspects of the deal with a team led by partner Mahesh Varia. Linklaters – who has acted for Amlin since the company was first listed in London in the early 1990s – advised on the deal with a team led by corporate partners Aedamar Comiskey, Nicola Mayo and William Buckley, and employment and incentives partner Gillian Chapman. Cross-border teams from Sullivan & Cromwell and Latham & Watkins have landed the lead roles on the $40bn takeover of Allergan’s generic-making business by Teva that has seen the Israeli pharmaceutical powerhouse also abandon its bid for Mylan. Dublin-headquartered biologic-drug business Allergan is selling its generic business for $40.5bn, including its legacy Actavis generic business, which Latham advised on the acquisition of in March this year; Medis, a third-party supplier; the company’s global generic R&D unit and its generic manufacturing operations. The Irish drug maker is keeping its biosimilars development program, its Anda distribution business, and its medical aesthetic business which includes brands such as Botox. Latham used a large cross-border team representing Allergan with advice on corporate/M&A matters fielded by New York/Orange County partner Charles Ruck and Orange County partner Scott Shean. Finance advice was provided by New York-based partner Wesley Holmes, with London-based Sean Finn and US partners Laurence Stein and Nicholas DeNovio providing counsel on tax matters. The rest of the team included partners Jim Barrall and Catherine Drinnan in London working on benefits and compensation; and US partners Kenneth Schuler on IP; Stuart Kurlander and Carolyne Hathaway on regulatory; and Christopher Norton on environmental matters. Weil, Gotshal & Manges’s Washington DC office advised Allergan on antitrust matters in the US with a team led by partners Steven Newborn, Ann Malester and Jeff White. Competition outside of the States was handled by Cleary Gottlieb Steen & Hamilton with a team led by Romano Subiotto QC, based in Brussels and the City, while New York finance partners Meme Peponis and Jeff Karpf handled parts of the deal’s finance. Sullivan & Cromwell advised Teva on the purchase with corporate partners Joseph Frumkin and Krishna Veeraraghavan in New York, Eric Krautheimer in Los Angeles and Palo Alto-based Sarah Payne. In London tax partner Michael McGowan and antitrust specialist Juan Rodriguez provided support with the rest of the US firm’s team including IP partner Nader Mousavi in Palo Alto and New York partners David Wang, Steven Holley and Matthew Friestedt, covering tax, antitrust, and executive compensation and benefits respectively. In June, the firm stepped in to represent the company on its $40bn unsolicited bid for Mylan, following a judge’s ruling that Kirkland & Ellis could not move forward in representing Teva because of a conflict. That deal, which has now been abandoned due to the Allergan purchase, also saw Benelux firm De Brauw Blackstone Westbroek and Israeli outfit Tulchinsky Stern Marciano Cohen Levitski & Co advising Teva. The deal is on a cash free and debt free basis and, on closing, will see Allergan receive $33.75bn in cash, which will be financed through a combination of new equity, debt financing and cash on hand. Allergan will also receive Teva shares valued at $6.75bn, representing under 10% ownership stake in Teva and retain 50% of Teva’s future economics from generic drug lenalidomide (Revlimid). Approved by both the Teva and Allergan boards, the transaction is expected to close in the first quarter of 2016. Following completion, Teva is expected to have sales of around $26bn with an EBITDA of $9.5bn in 2016, including an estimated $11bn in sales outside of the US. US firms Skadden, Arps, Slate, Meagher & Flom and Sullivan & Cromwell have advised on Nokia’s plans to take over Alcatel-Lucent in a transaction that values the French rival at €15.6bn. Announced today (15 April), Skadden is advising Nokia on the tie-up with a team led by London-based global transactions co-head Scott Simpson; Paris-based Armand Grumberg, who heads the firm’s European M&A practice; and London corporate partner Michal Berkner. The cross-border team further includes partners Ryan Junck, Jose Esteves, Fred Depoortere, Steve Sunshine, Matthew Hendrickson, Ivan Schlager and Peter Huang. Meanwhile, Sullivan & Cromwell partners Rich Morrissey and Gauthier Blanluet are jointly leading for Alcatel. Based in London and Paris respectively, the pair advised alongside London partners Juan Rodriquez and Joram Lietaerte Peerbolt, Palo Alto partner Nader Mousavi and Steve Holley in New York. Alcatel’s board was advised by Latham & Watkins’ Paris partners Patrick Laporte and Pierre-Louis Clero. The deal, which has already received the French government’s approval, sees Nokia make an offer of 0.55 new Nokia shares for every Alcatel-Lucent share issued in France and the US. The proposed transaction, which is expected to close in the first half of 2016, is subject to approval by Nokia’s shareholders, plus other regulatory approvals and conditions.